Reformist political activist Mohammadreza Jalaeipour, an Oxford University PhD student, has been held without charge and access to a lawyer for more than a month since being arrested in Tehran by the Intelligence Organization of Iran’s Islamic Revolutionary Guard Corps (IRGC). His father, reformist politician Hamidreza Jalaeipour, told the Center for Human Rights in Iran (CHRI) that his son has only been allowed to make five brief phone calls during his detention. Before being arrested on April 18, 2018, outside the home of former reformist President Mohammad Khatami (1997-2005), Mohammadreza Jalaeipour, 34, had recently returned to Iran from the UK where he is a sociology PhD student at Oxford University. He had been arrested several times during the protests that followed Iran’s disputed 2009 presidential election for campaigning for reformist candidates and has spent a total of five months in detention. He was released in August 2010 on bail set at three billion rials (approximately $300,000 USD at the 2010 rate) but was never prosecuted. Mohammadreza Jalaeipour’s father is a central committee member of the Islamic Iran Participation Front (IIPF), a reformist party close to Khatami and President Hassan Rouhani. In October 2017, Hamidreza and six other IIPF politicians were charged with “propaganda against the state” and sentenced to a year in prison and banned from expressing their views to news outlets and on social media. The Appeals Court has not yet ruled on their appeal. On May 26, Hamidreza Jalaeipour posted a note on his Telegram account in which he enumerated what he described as the unlawful actions of the IRGC’s Intelligence Organization in detaining political and civil rights activists. “In these 40 days, the only person I have not had access to is the supreme leader [Ali Khamenei] but we have followed up on Mohammadreza’s case with judicial authorities, politicians and clerics to the extent we could but I still have not received an official answer,” he wrote. 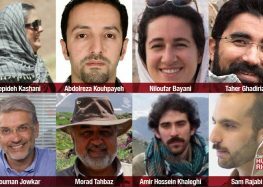 Hamidreza Jalaeipour also called for the release of the dozens of environmentalists who have been detained in Iran on unsubstantiated espionage allegations by the IRGC since January 2018.